Curried dishes is a big favorite in our house thus it has also become a standby dish. When we can’t think of anything to cook, we start pulling things out of the refrigerator, add curry and presto! We’ve got dinner on the table. Melt the butter over medium heat and add pork. Stir fry until edges are starting to brown. Add garlic and ginger, stir fry for a couple of minutes then add the onions and jalapeno peppers. Cook for a couple more minutes. 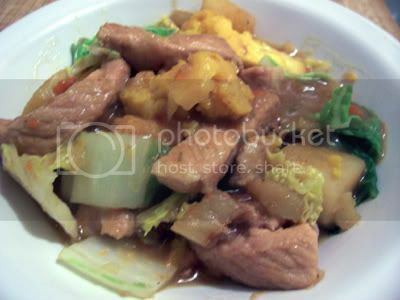 Add the carrots and celery, stir in the oyster sauce and curry powder. Add the coconut milk and water and bring to a boil. Add the potatoes and simmer on medium low for 15 minutes. Add the cauliflower and cook for 5 minutes. Add the cabbage, stir through. Adjust the seasoning; add more salt as necessary and turn off heat. I love curry too but don’t fix it very much because hubby isn’t crazy about it. He will eat it but would rather have other things.